THE CONFERENCE IS NOW COMPLETED. WE ACKNOWLEDGE ALL PARTICIPANTS, AUTHORS AND SPEAKERS FOR THE SUCCESS OF THIS YEARS CONFERENCE. 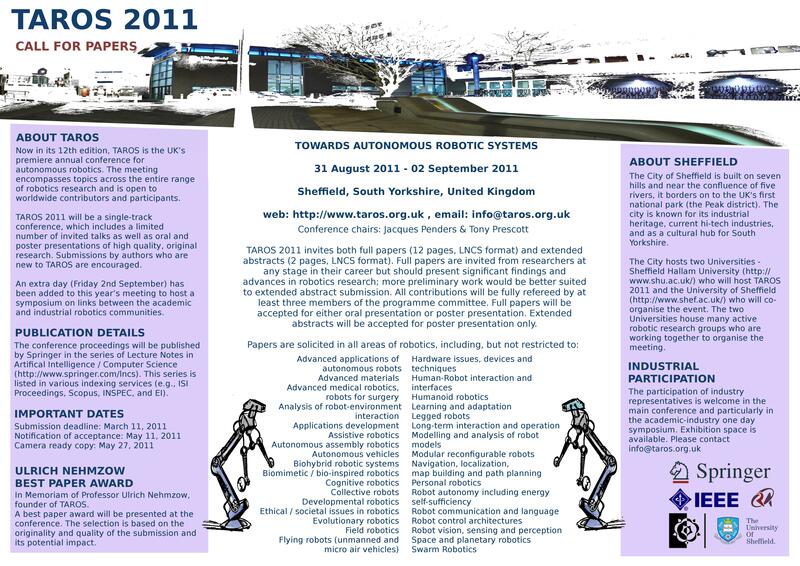 Now in its 12th edition, TAROS is the UK's premiere annual conference for autonomous robotics. The meeting encompasses topics across the entire range of robotics research and is open to worldwide contributors and participants. TAROS 2011 will be a single-track conference, which includes a limited number of invited talks as well as oral and poster presentations of high quality, original research. Submissions by authors who are new to TAROS are encouraged. The conference proceedings will be published by Springer in the LNAI/LNCS series. The series is listed in various indexing services including EI, ISI Conference Proceedings (listed in ISI Web of Science), Scopus, ACM Digital Library, and Google Scholar. Selected papers from the conference will be published in a Special Issue at the Elsevier journal of Robotics and Autonomous Systems. An extra day (Friday 2nd September) has been added to this year's meeting to host a symposium on links between the academic and industrial robotics communities. Springer to sponsor the Ulrich Nehmzow Best Paper award: The Ulrich Nehmzow best paper award prize winner will receive a books voucher sponsored by Springer. A special issue with selected papers from TAROS 2011 proceedings will be published in the Elsevier journal of Robotics and Autonomous Systems.